The HealthRest Caprina Queen Latex Mattress and Box Spring by Restonic at Town and Country Furniture in the Hamburg, Buffalo, Lackawanna, Eden, NY area. Product availability may vary. Contact us for the most current availability on this product. HRfdn-Q Queen High Profile Foundation 1 9"
Caprina-Q Queen Latex Mattress 1 11"
Coils and Support 8" High Density Eco-Friendly Polyurethane Support Core eliminates partner disturbance. The HealthRest Latex Foam collection by Restonic offers the luxurious contouring comfort of high-quality latex. A renewable and sustainable resource, latex gives you a more supportive and hygienic sleep surface. 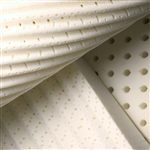 Its natural porous and anti-microbial properties allow the mattress to breathe and resist bacteria, dust mites and mildew. Enjoy a more healthy and refreshing sleep with a mattress from the HealthRest Latex Foam collection. The HealthRest Caprina collection is a great option if you are looking for Mattresses in the Hamburg, Buffalo, Lackawanna, Eden, NY area. Browse other items in the HealthRest Caprina collection from Town and Country Furniture in the Hamburg, Buffalo, Lackawanna, Eden, NY area.